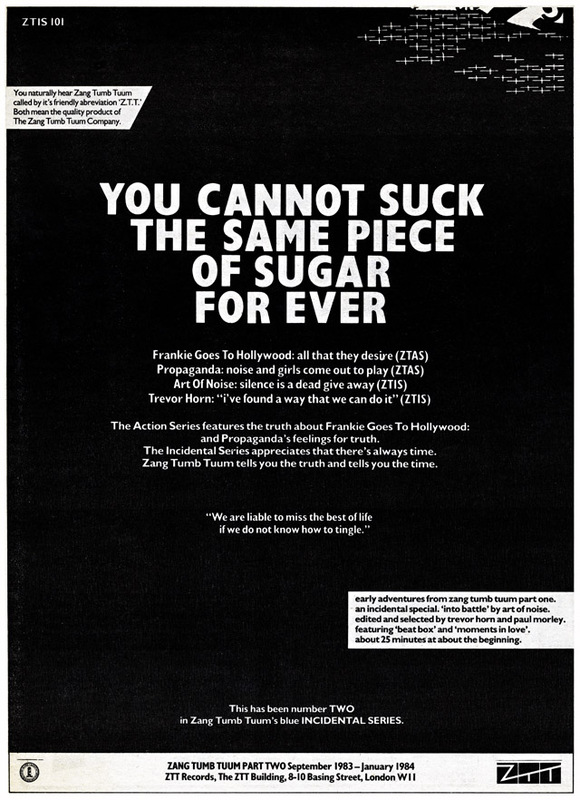 A lot of ZTT’s adverts were provocative but this one sets out its stall a little more subtlely than most with a title that states that things have to change eventually. I love these early ones, along with their blue dotted wall variations, as they’re like mini Futurist manifestos, setting the stage but giving very little away. Paul Morley‘s own little editions of Blast! (ironically the title of Holly Johnson‘s first post-ZTT LP). It’s interesting to note the inclusion of Trevor Horn‘s name in these too, remember, to the average music fan, his name would have been the biggest strength to play on. He’s listed equally as an artist and looks like he’ll be getting a release on the Incidental label at some stage in the future. ‘zang tuum tumb part one’ is mentioned in the lower right side bar – presumably referring to the six months of activity prior to the label’s first release. The quote is taken in part from ‘Look at the Harlequins!‘ by Vladimir Nabokov, ‘We are liable to miss the best of life if we do not know how to tingle, if we do not learn to hoist ourselves just a little higher than we generally are in order to sample the rarest and ripest fruit of art which human thought has to offer’. It’s obvious where Morley’s ambitions lay, something they’d realise sooner rather than later. The original is framed and was recently moved to ZTT’s London office. A couple of years ago it was hanging in the offices of Perfect Songs, where it was photographed for the booklet of The Art of the 12″ Volume II. What release is the Trevor Horn CTIS a reference to? Mark, no one knows, it was probably something that they’d earmarked in the future but plans can change. Note, too, that the label name has changed from the first “Hello” ad, from Zang Tuum Tumb to Zang Tumb Tuum (and it would go on changing back and forth for many years to come, of course)….